Why Barf? The ingredients of the Pin Oaks BARF (Biologically Appropriate Raw Food) dog food is all human-grade. The individual raw ingredients are sourced, processed and packaged by us under hygienic conditions. We include neither chemical nor synthetic preservatives, flavour-enhancers, vitamins, minerals or colourants. This provides the food with micronutrients with their attendant satellite factors. Just as there are significant differences between the formulations and quality of the various kibble brands, there are also significant differences between the various raw food products available. Simply Pets Raw Food is the first and only veterinary formulated raw food in South Africa, using only the highest quality ingredients for optimal health. Because all of our products are 100% balanced, there is no need for additional supplementation. You can rest assured that your animal friend is getting his or her best chance at health! Raw Food for Pets (Pty) Ltd is the leading provider of biologically appropriate raw diets (BARF). We don't just keep top all the top quality raw food brands for dogs - we offer the same top quality for both your favourite feline and pet snake. When it comes to holistic supplements, we have the very best of creams, ointments and herbal medicine & supplements available for your pets,including your horses. We know how much you love them, so offer you a range of tasty, natural and organic treats, including Rabbit and Rodent Gourmet Treats. 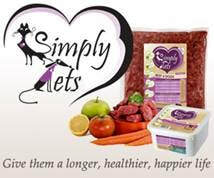 The Simply Pets Raw Food range was originally developed, by Dr Anuska Viljoen, as a primary treatment in dealing with various ailments in cats or dogs. Due to popular demand, the foods became available on a commercial basis, giving more pets access to the undeniable benefits of a perfectly balanced raw diet. However, Dr Anuska is still very much involved in the production of the foods. She is also available to assist and support her customers making the transition to raw feeding.